Captains Erasmus and Ofelia Vargas are Salvation Army officers assigned to Tijuana, Mexico, the largest city on the Baja California Peninsula with 1.8 million people as of the 2010 census. And they are in the right place to do so. Tijuana—sometimes referred to as the “Bangkok of Latin America”— is the most visited border city in the world as over 50 million people cross between Tijuana and San Diego each year. Here, The Salvation Army, via the Vargases, operates a corps, two outposts and three social services programs—a Migrant Center, the La Gloria Extended-Hours Day Care Center, and a Battered Women’s Shelter in Ensenada—aiming to prevent human trafficking and protect women from abuse. Mexico is a large source, transit and destination country for human trafficking, according to the U.S. State Department’s Trafficking in Persons (TIP) 2011 report. To make matters worse, public fear of criminal organizations—many of which are involved in trafficking— impedes the ability of government and civil society to effectively combat trafficking. Worse still, non-governmental organizations (NGOs) and government representatives report that some law enforcement officials tolerate and are sometimes complicit in trafficking, impeding implementation of anti-trafficking statutes. Yet, the country is taking steps to eradicate this abuse of people. In 2007, the Mexican government enacted federal legislation to prohibit all forms of human trafficking. In 2010, the country achieved its first conviction and sentencing for forced labor and sentenced four trafficking offenders with four to 17 years imprisonment. It also passed a national anti-trafficking action plan and designated $4.2 million to implement it in 2011. With funding from a foreign government, authorities launched a beta version of a website to track trafficking cases and legislation in Mexico. The Vargases began volunteering with The Salvation Army in Mexico City. They later became auxiliary captains and then were commissioned as captains in 2004, the same year as their daughter. The couple served for 15 years in Mexico City and have now been stationed in Tijuana since 2006. They have adopted six children and have three of their own. 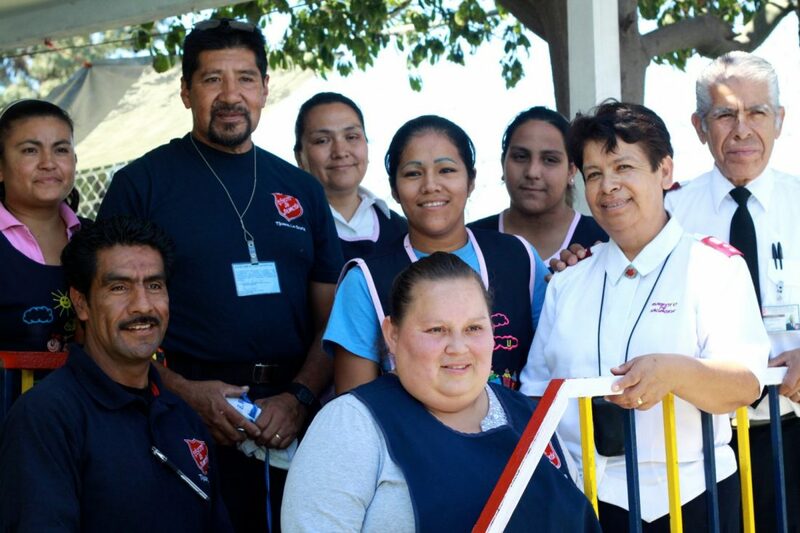 The Salvation Army’s Tijuana Corps sits on a back street within walking distance of the U.S./Mexico border. Run by the Vargases, the corps has roughly 70 members but the facility is more commonly known in the community as the Migrant Center, which opened in 1957. Here, roughly 200 recently deported and homeless men have a place to eat dinner, take a shower, receive support and make international calls as they transition to self-sufficiency—all for 15 pesos ($1.10 USD) a night if they can afford it; as long as there is still space, no one is turned away. The center has two large rooms that are lined with bunk beds. To sleep more people, carpeting is laid down at night anywhere possible—including in the dining room and bathrooms. In the busiest times, such as the winter, an old school bus outside can sleep an additional 30 men. Because it’s illegal in Tijuana to be a transient on the street, the bus also serves as a waiting room until the center’s doors open at 4 p.m. The program operates on $50,000 a year, $9,000 of which is provided by the Mexican government. The Vargases are currently looking for donations to replace the center’s mattresses. “The idea is to help men who come back across the border to be literally less stranded,” said Major Sallyann Hood, territorial social services secretary in Mexico. Ruben, 35, was deported from Compton, Calif., where he had lived for 13 years with his family. He worked construction, taking electrical and plumbing day jobs, when outstanding tickets turned into a warrant, he was eventually deported. New to Tijuana, Ruben went looking for work and was shot at. Released from the local clinic, the police dropped him off at the Migrant Center, his bullet graze wounds still bandaged. Ruben sat down in a muted Hawaiian shirt with palm trees reminiscent of his Southern California past—its subdued colors matching the gloom in his eyes. Alejandro, 36, was similarly deported after a runin with authorities, declaring himself a former Tokers Town gang member from Fullerton, Calif. “I’m here because I messed up,” said Alejandro, who was taken to the U.S. as a 1-year-old child and eventually graduated from high school in Southern California. “I understand the laws; I had a chance. Tears dropped down Alejandro’s face as he explained that his kids—seven in total, ages 3 to 16—now allow him to talk to them after six years of no communication. A short drive from the Migrant Center, on a road just below numerous facilities and factories of multinational conglomerate companies up in the hills, leads you to La Gloria—a sector of Tijuana and the name of another program the Vargases oversee. It was lunchtime as a van full of kids from the first school session of the day arrived and joined the other kids waiting in line to wash their hands before eating. One boy, no older than 2, squealed as half of a homemade tamale was placed in front of him. The La Gloria Extended-Hours Day Care Center came about after cases of kidnapping and child trafficking in the area left parents worried about leaving their children at home while they went to work. Now in operation for three years, this center is open during the week from 5 a.m. to 10 p.m. and provides 30 kids—newborn to 10 years—with three meals a day, transportation to and from the half-day sessions of school, and a positive place to be. “We knew there had to be a safe place for kids to go and have a sense of security, that they are not home by themselves or on the streets,” Vargas said. As they eat, it’s clear the children are content, happy and secure. Margareita, 9, has been coming to the center since it opened in 2008. She said she loves it, and appreciates that the staff helps her with homework. Another child, Dianali, 5, enjoys the computer classes and the Barney and princess toys. The facility resembles a single-family home, with an outdoor yard, swing sets and playground toys. The cement walls surrounding the center are colorful and bright—a stark contrast to the streets outside. The walls were low, so the Army added chicken wire to raise the height and prevent easy access in fear of theft or kidnapping. Parents must prove that they are working, cannot leave children longer than 10 straight hours, and pay 300 pesos ($22.30) per week for the care. Vargas said most of these moms make 800-1,220 pesos ($60-90) a week. A small number of scholarships are provided to those who cannot affordto contribute. She said the center is currently developing a plan with the community for safe houses—local homes children know they can go to if they feel unsafe or threatened when they’re in the community. Vargas also has a relationship with the local government, and serves as one of its spokespeople against human trafficking. Led by Ana Quintero, the center has five staff members and a number of volunteers. Quintero often individually counsels the parents, and opens the facility on Sundays as a Salvation Army outpost. This past May, a number of children from the outpost traveled to Mazatlan for Junior Soldier Camp. The Canada and Bermuda Territory purchased the La Gloria Day Care Center property and provided support for three years, with additional assistance from the Vista Hermosa Foundation via The Salvation Army World Service Office (SAWSO). In 2010, the Australia Southern Territory gave the center $300,000 for a new building and support during the next five years, along with furniture provided by the USA Western Territory’s women’s ministries department. Final plans for the new building, which will allow space for an additional 10-20 kids, are under review. Hood said they are now working on decreasing support to transition the program to independence in the next five years. “This is a practical, community appropriate prevention project that has increased the community’s knowledge on trafficking and therefore decreased child trafficking in La Gloria,” said Lindsey Bailey, SAWSO anti-human trafficking program manager. “The day care staff have been keen to educate the children, their parents and the community at large about the dangers of trafficking, equipping them with the right tools to put an end to this crime that has characterized the city of Tijuana for far too long. “This project is a great example of The Salvation Army using it’s strengths to meet the needs of the people in the local community and will serve as a model for other territories hoping to engage in the prevention of human trafficking,” Bailey said. The Vargases also opened a shelter for abused women in Ensenada. It houses up to 10 women and their children, providing family therapy and basic needs. “Mexican officers work very hard under very difficult circumstances,” Hood said, “The Vargases just don’t give up. If someone says there is no money, they find it. For example, they started a bazaar in the driveway of the corps to earn support money for the Migrant Center. The Vargases know they have accomplished much for the people of Baja California, but say they are not comfortable talking about themselves. Christin Thieme is the editor in chief of The Salvation Army New Frontier Publications. She's had her passport confiscated in Pleiku, Vietnam, waded through destruction in New Orleans, interviewed prostituted women in a former brothel in Mumbai, sat down with government leaders in Cuba and shadowed the local mayor at a Palestinian rally in Nazareth—all in the name of journalism. She holds a master’s in specialized journalism from the University of Southern California Annenberg School of Journalism and formerly taught communications as an adjunct professor at California Lutheran University. She has been awarded for writing and reporting, including a first-place prize, from the Evangelical Press Association.